Hey, Chicago. 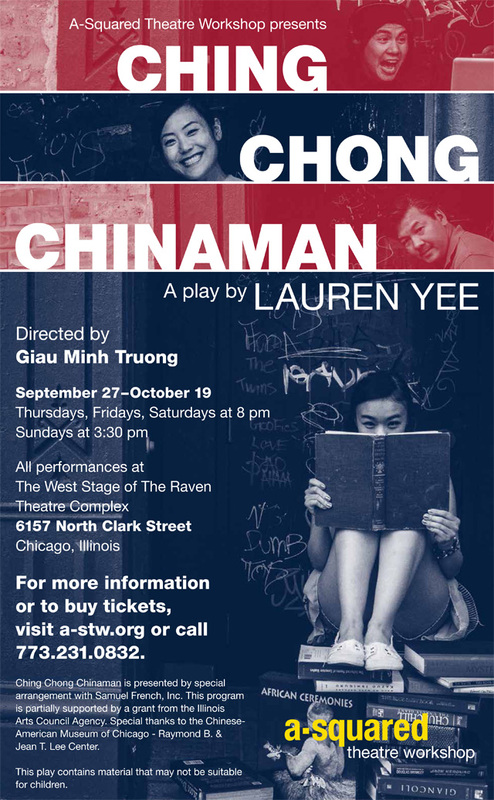 From now until October 19, you can watch a performance of Lauren Yee's Ching Chong Chinaman, a satire of Asian American identity that explores what happens when a Chinese American family loses all sense of their cultural heritage. Performances will be held at the Raven Theater Complex. Named by Time Out Chicago as one of "17 theater shows to see this fall" in Chicago, Ching Chong Chinaman by Lauren Yee satirizes the Asian American identity and explores what happens when a Chinese American family loses all sense of their cultural heritage. The ultra-assimilated Wong family is living the American dream, but not all is perfect. Upton, the Wongs' youngest child, dreams of becoming a World of Warcraft champion and the only things that stand in his way are his daily chores and homework. Desdemona, the Wongs' daughter, has goals of attending Princeton, but her math grades are not up to par. Upton comes up with an idea to solve both their problem by acquiring Jinqiang, a Chinese indentured servant who envisions an American dream of his own. *The Friday, October 3rd performance will be a "Chinese Community Night" performance and reception organized by the Chinese-American Museum of Chicago with proceeds benefitting A-Squared Theatre Workshop. For more information, visit the A-Squared Theatre Workshop website. To purchase tickets, go here.